I have a serious question for you.. does your Sunday morning involve these breakfast cookies? If it doesn’t then you might want to rethink your plans and add these to your brunch menu for tomorrow morning. 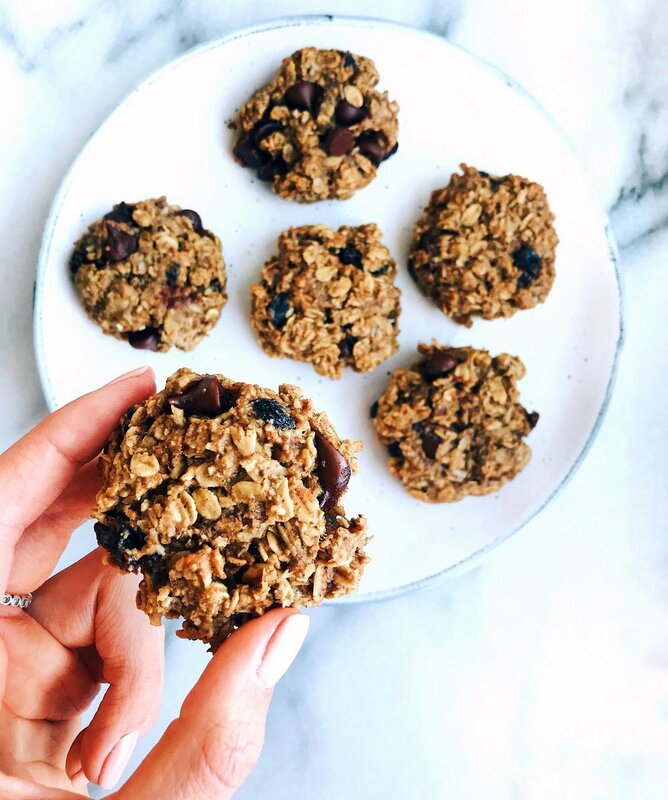 These cookies are dairy free, gluten free, low in sugar, high in fibre, full of vitamins and nutrients and bomb AF.. They’re so good that they fooled one of the pickiest eaters I know, I’m not kidding you guys they're next level good. Plus as always they’re super simple to make and you probably have all of these ingredients kicking around in your pantry. So are you sold yet? It’s really a yes or yes question. Preheat oven to 350F and line a baking sheet with a silicon baking mat or parchment paper. In a medium bowl mash banana then add peanut butter and mix until combined. Add in all other wet ingredients and mix until combined. Add in all dry ingredients and mix until thoroughly combined and all mix ins are evenly distributed - batter should be thick. Divide into 16 even balls and place on baking sheet. Cookies will not spread soy can fit all 16 on one sheet, flatted balls with the palm of your hand. Bake for 12 minutes or until bottoms are golden brown. Allow to cool and then dig in! Hi I'm Lulu, I am a Certified Personal Trainer, Registered Nutrition Coach and soon to be Registered Holistic Nutritionist based out of Vancouver, Canada. I am a self proclaimed sweat enthusiast, recipe developer and long time lover of all things health and wellness! My hope is that through simple and nourishing recipes, holistic practices and my own experiences I can help you achieve total balance and feel good about your health again. Let me slide into your DM’s..
WANT MORE OF ME. IN YOUR LIFE? LET ME SLIDE INTO YOUR DM'S! Subscribe for weekly recipe’s, workouts and wellness tips straight to your inbox!